Welcome to Newmarket Hill – a South Down Blog! Two hundred metres above the nearby English Channel, Newmarket Hill crowns that part of the South Downs which lies between the towns of Brighton to the west and Lewes to the east, and between the villages of Rottingdean to the south and Falmer to the north. It’s top is in the parish of Kingston near Lewes, the village of which is about a mile and half away. However, it is now only about a mile to the north-east of the relatively modern village of Woodingdean and a mile and a half to the north-west of the deserted medieval hamlet of Balsdean. Its south-eastern slopes form a part of Castle Hill National Nature Reserve which is a site of European importance. This blog is about the history and ecology of its surrounding downland. 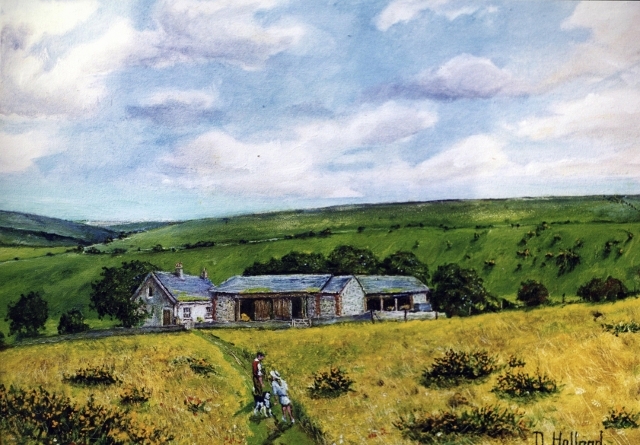 Newmarket Farm by Douglas Holland. 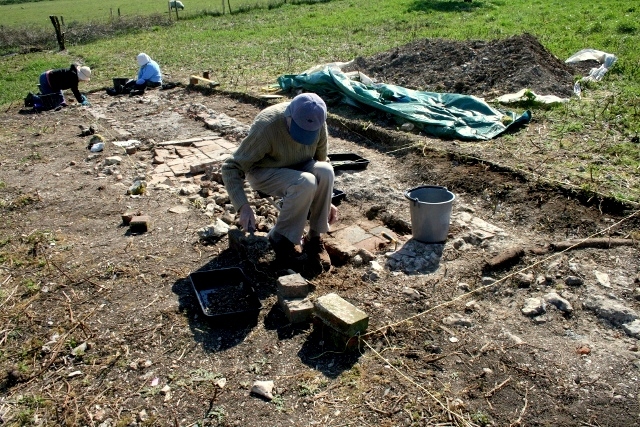 In April 2013 I managed – as a volunteer for Natural England – a community based excavation of the site of a 19th century farm labourer’s cottage, farmyard and barns called Newmarket Farm, just inside Castle Hill NNR, near the summit of Newmarket Hill. It was built in 1830 and was the birth place of my mother in 1942, shortly before it was requisitioned for military training by British and Canadian troops stationed both locally and further afield in SE England. Newmarket Farm location. Overlay of old and new O.S. maps and Google satellite images. Newmarket Farm photo possibly taken in about 1924. From a collection of photos by Capt. Bertie Hubbard Maclaren. Brighton & Hove Royal Pavilion and Museums, ref. HA930078. The Newmarket Farm was probably built in about 1831 – which puts it right at the end of the Georgian period. The archaeological evidence, in keeping with personal memories and the above photograph, all indicate that for most of its life it was roofed with Welsh slate. 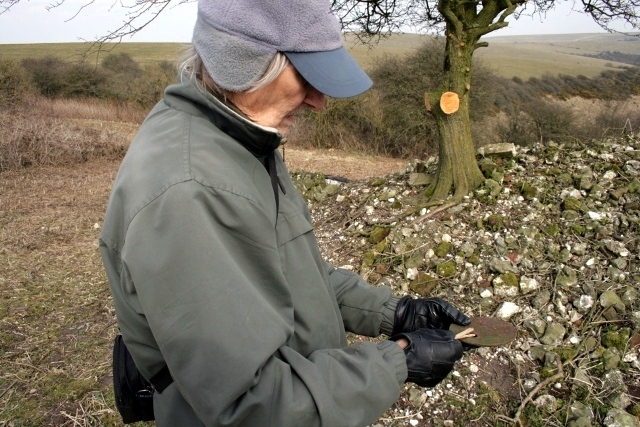 But has it always been roofed with slate – as our archaeological evidence has indicated? Personal communications with local archaeological experts have told me that Welsh slate arrived in Sussex with the coming of the railways, though they have also said that it is possible that some arrived earlier. Unfortunately those I have spoken to were unaware of any research on the matter. So – reluctantly – I have made a start via the Internet. The Slate industry in Wales was my first port of call. And I was ecstatic with joy to discover that in 1831 – the most likely date for the building of Newmarket Farm – excise duty was removed on the inshore shipping of slate!! Thanks to Google Books I was able to confirm this from pages 46-47 of their scanned copy of The Statutes of the United Kingdom of Great Britain and Ireland [1807-1868/69], Volume 71, His Majesty’s Statute and Law Printers, 1831. The biggest expansion in Welsh slate production was undoubtedly due to the railways in the 1840s, however the 1831 abolition of an excise duty of 20% resulted in an earlier boost to production. Not proof, but it is a start. The assumption would be that either the Kingston estate or some other Sussex merchant would have loaded a ship with grain for sale at a Welsh port, returning with roofing slates as ballast on their return journey. Further searches for historic slate roofs led me to discover that Brighton’s Royal Albion Hotel, which was built in 1826, was also roofed in slate. However, insufficient information was provided in Historic England’s description to prove to me that the slate could not have been a later addition. Some further general information was provided by the Regency Society on slate roofing. They cited a number of secondary sources on the Internet from which they were able to that conclude that Welsh slate “is a quintessentially Georgian building material“. One such webpage by Ron Martin on slate roof tiles in Brighton was particularly informative. The light weight and water-impervious nature of slate made it an ideal building material. The main challenge to its use was the cost of transport. The Penrhyn Slate Quarry, by Henry Hawkins, 1832. From National Trust Images, Penrhyn Castle. My main source to understanding the history of the Penrhyn quarry was the Slatesite website. Welsh slate mining was essentially just a cottage industry until the self educated William Williams of Llandygai (1738 – 1817) proposed to his master, Richard Pennant, 1st Baron Penrhyn (1737 – 21 January 1808) that the slate mines could be managed on a capitalist basis in the 1770s. Demand could be met at lower costs, by owning and managing the mines, the workers, the road, the horse-drawn railway, as well as the shipping from Port Penrhyn, which the estate also owned. Other mines and quarries also expanded to meet the demand for this luxury roofing material. So it was that the government saw it as a means of income, through the levying of a 20% tax on its coastal shipping in July 1794. Six Degrees to Newmarket Farm! There are supposed to be six or less degrees of separation between any two people on this planet. It certainly seems to be true for the slate on the roof of Newmarket Farm! Richard Pennant, who I have discovered to have been the owner of the Penrhyn Slate Quarry, founded his fortune through the slave trade, providing his lucrative West Indian sugar plantations with cheap labour. As an MP he was the first to speak against William Wilberforce in the famous debate in parliament on the abolition of the slave trade, in 12th May, 1789 (The Speeches of Mr. Wilberforce, Lord Penrhyn, Mr. Burke, Sir W. Young, Alderman Newnham … &c. &c. on a Motion for the Abolition of the Slave Trade, in the House of Commons, May the 12th, 1789. To which are Added, Mr. Wilberforce’s Twelve Propositions, John Stockdale, 1789, pp. 5-14). The father of Charles Jenkinson, 3rd Earl of Liverpool, also had strong views against Wilberforce. The 3rd Earl’s estate was at Buxted in Sussex. He moved the village to improve his view. One of the villagers moved was the father of Martin Brown. Martin Brown’s family later moved to the slums of Brighton. He became an habitual criminal, and whilst on the run from the police sought lodgings in the Newmarket Farm. The Newmarket Farm had a slate roof, possibly sourced from the Penrhyn Slate Quarry. Not proof that the Newmarket Farm was built with a roof of slate. But an exciting story full of new directions for further research! Each task involves many steps. Fortunately, over the past two years, I have had advice and support from Lisa Fisher (Archaeology Services Lewes), Archaeology South-East, Brighton & Hove Archaeological Society, Brighton Museum, Society for Post-Medieval Archaeology Society, Luke Barber (Sussex Archaeology Society), Sussex Military History Society, Chris Butler (Sussex School of Archaeology), and the Sussex Weald Young Archaeologists Club, amongst others, reviewing my contexts, sorting our finds into their different types, washing our pot and glass, preliminary finds identification, advice on report writing, etc. Unfortunately I have had so much advice and support, including reading material from a number of academic books and the Internet, it has left my head spinning! So, back to the beginning, and my Newmarket Farm Excavation Project Design document. 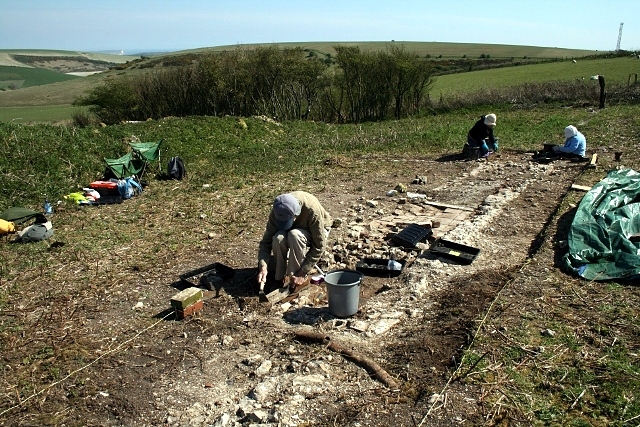 Based on published advice from the East Sussex County Archaeologist, I largely followed Historic England’s Management of Research Projects in the Historic Environment. From this I produced a ‘Summary of Stages and Products’ in advance of starting the dig. Is it in line with current advice? Is the proposed methodology appropriate? (After each fieldwork stage:) Is an updated Project Design document required? Is the site archive complete? Does assessment merit full analysis or should the project proceed to Dissemination stage? Is the Updated Project Design appropriate? Analysis complete in line with project objectives? Has analysis delivered an enhanced understanding? Site Archive and Research Archive ready for deposition? Report text prepared in line with dissemination plan? Can recommendations for future research be made? All Tasks & Products completed? This is quite a list! No wonder my head is spinning!! But now I have copied it out, I am able to say that I like long lists – nicely, logically set out. If I work through each of these items – breaking them down into smaller steps when required – working towards the production of a project archive, the dig report should almost write itself. It is, simply speaking, just a polished, edited version of the dig archive, tailored for busy professional archaeologists. Likewise for the public presentation. The most popular question I am asked about my research is “am I writing a book” (and “when will it be published”)? An early draft of the book is already available to read on this website (though without images, for I have yet to request copyright approvals for them all). However a publication date is quite a while away. 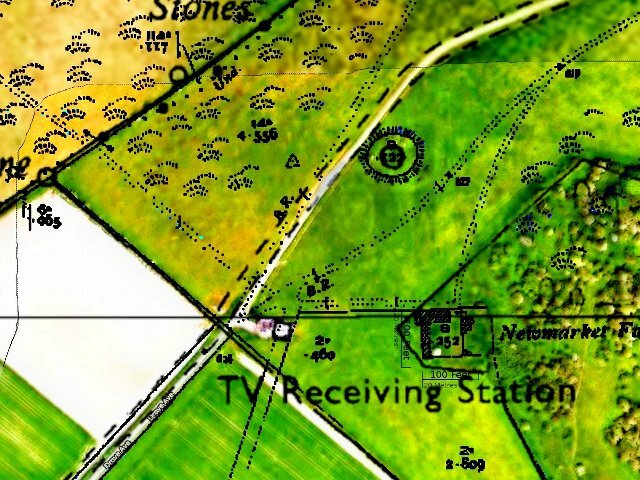 After working on how to retell my recent WW2 Balsdean talk for this blog, I have a long awaited archaeological dig report to produce. The dig was three years ago and so is long overdue. Fortunately the delay has enabled me to obtain a much clearer idea of what may be involved, including how to best to record the large number of finds which occupy a large part of parent’s garage. Being new to archaeology I have no idea how long it will all take. All I can say at present is that I hope to have finished well before Christmas! Once the report has been published there is the possibility of returning back to the Newmarket Farm site for further digging. We did an excellent job uncovering the site of the cottage and it’s front yard. It would be nice to formally confirm the locations of all the other structures on site. My aspiration is to construct a 3d digital model of the site. I hope to discover how to create an accurate model based on the only photograph discovered (as yet) and a ground plan, partly or wholly based on archaeological excavation. I also wish to survey and record as much of the 19th century to WW2 archaeology as I can in the Kingston, Balsdean, Woodingdean area. To this end I have started teaching myself how record and share geographic and other information using the Open Source program Qgis. 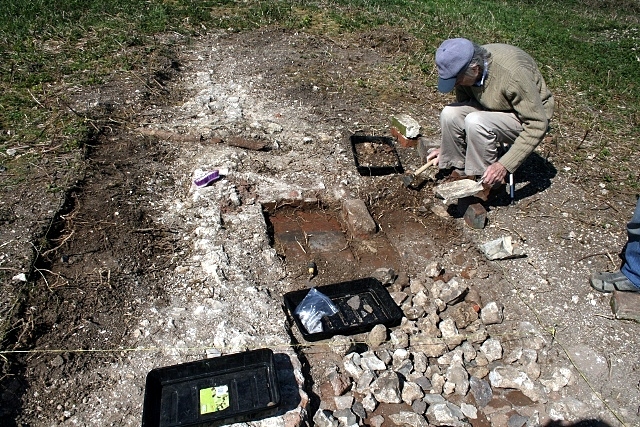 Learning to record archaeological features in the field using more traditional methods would also be extremely useful. Meanwhile, there is my unfinished book. This has now (at least in my mind) become four books, for I feel that I have material enough (with more research) for four different audiences. The first to be written is an introductory overview to a subsequent trilogy covering different aspects of the Newmarket Farm’s history. The first has already been drafted. It is an overview of the lives, places and events which have been associated with the remote South Downs labourers’ cottage and barns known as Newmarket Farm, from shortly before its construction in 1830 to shortly after its destruction in 1942. I hope to find a commercial publisher for it – though there may be issues associated with finding the money to pay for copyright permissions of images, etc. Fortunately these are issues I don’t have to worry about for a year or two. The first (historically) of the subsequent trilogy is planned to detail the origins of the Newmarket Farm. It was constructed as an outfarm, as part of the many changes which would have been associated with the enclosure of Kingston Near Lewes in 1830. The book would aim to relate the particularities of the agricultural parish of Kingston to the wider issues associated with the agricultural ‘improvements’ of the late 18th and early 19th centuries. Its emphasis would be social, environmental and agricultural. A second and equally important part of its research would be an attempt to understand the social aspects (in its widest sense) of an agricultural labourer’s life in such a geographically isolated location. Whilst I am aware of many books written about the ‘agricultural revolution’, I have yet to find a book which explores the social consequences of living and working on a remote outfarm. The next book (historically) is intended to be centred around the murder which occurred at the Newmarket Farm in 1868. The murderer, Martin Brown, was from the slums of Brighton. The murdered agricultural labouring tenant of Newmarket Farm, David Baldy, was born and bred in rural Falmer. This tragic event provides an insight into the life and lives of nineteenth century poverty, both rural and urban. Surprisingly, though their lives were very different, the quality of life of the Brighton slum children was not necessarily worse than those of their country cousins. Average life expectancy in rural Kingston Near Lewes in the mid-nineteenth century was just 25, more or less exactly the same as the worst industrial cities in Britain. Also, because it was a murder, the newspapers wrote lengthy columns about who was doing what, where, and when. This kind of information is not normally available for the rural poor. A wonderful (though tragic) opportunity to look into everyday lives in extraordinary circumstances. And the murder story and subsequent police chase makes for a ripping yarn! Who wouldn’t want to read such a book. The final book in the trilogy (though not necessarily the last to be written) starts with the events leading to the sale of the Newmarket Farm to the new owner of the neighbouring Balsdean Farm, just after WW1. The socio-economic factors which led to the ‘Great War’ also played a hugely significant role in changes of land use and ownership from the late Edwardian period. These also continued on during the inter-war years and played a huge role in the arguments for and against the creation of a series of South Down military training areas, resulting in the destruction of the Newmarket Farm – birthplace of my mother. This volume is essentially a description of the life and events, in war and peace, on a block of the South Downs between Brighton and Lewes. It would therefore also include the huge military reviews or mock battles which took place across these iconic downs, starting from the reign of the Prince Regent and ending in Edwardian times. So, four books centred around a remote farm labourers’ cottage situated just below the summit of the highest hill on the South Downs between Lewes and Brighton (an introductory overview, a late Georgian – early Victorian agricultural history, a Victorian murder combined with a ‘town mouse, country mouse’ social history, and a rural war and peace), archaeological excavations and related activities, these should keep me busy for a while! I also hope to give more talks and guided walks, and of course I intend to continue keeping the readers of this blog informed of my discoveries. Tanks move into Balsdean. Photo: Holland Mercer Collection. The WW2 Balsdean presentation I gave to the Sussex Military History Society last month was very warmly received. I plan to rework it into a suitable form to include in this blog, though it is likely to be a while before that happens. One reason is that I used several animated transitions comparing current views from Google Earth with old photos, as well as short videos of Google Earth fly-throughs to help my audience discover the location of the various places of interest given in the talk, as well as to better visualise the landscape as a whole. These were particularly tailored to the presentation media used and will probably need to be rerecorded so as to be more suitable for this website. Meanwhile, I have been asked to share how I achieved the animated transitions that were used in my talk. Firstly I should say that I mostly use free, Open Source tools wherever possible. This is partly for ethical reasons, partly because they are free (as in speech, not lunch), and partly because they (almost always) enable me to get my stuff done. However, if necessary I do use closed source and non-free software, such as Google Earth, if there are no suitable alternatives. The first and most important of my Open Source tools is the Ubuntu Linux operating system. I have used Linux for many years now and only very rarely have I needed to switch to Windows. Of the many varieties of Linux I chose Ubuntu because of its large user base and excellent online support. For my presentation I used LibreOffice (a version of OpenOffice) Impress. It is almost completely compatible with Microsoft PowerPoint, has similar capabilities and can be run on Linux, Windows and Apple Mac computers. Other presentation apps are available! For editing photos and other images I mainly use Gimp, an open source alternative to Photoshop which can also be run on Linux, Windows and Apple Mac computers. Other image editors are also available! I used to it to improve the images (contrast, brightness, colour, etc), reduce their resolution to that of my projector, and to crop them, as and when required. I also used it’s layer capabilities to line up my screenshots taken of GoogleEarth views, so to as closely as possible match the views shown in my old photographs of Balsdean, etc. Unfortunately there is no alternative that I know of to Google Earth for detailed exploration of 3d satellite images. Its ability to import geo-referenced images was especially useful. To do this I used QGIS, an open source geographic information system, similar to ArcGIS in capabilities. It is also available to download on most computers. Other GIS programs are available! To share my Google Earth fly-throughs, I needed to capture my desktop display as a video. The program I chose was recordMyDesktop. It has a pretty basic functionality, but was adequate for my purposes. It only runs under Linux, though there are many alternatives that work on different platforms. Unfortunately the file size of the videos produced by recordMyDesktop were quite large, so I used a graphical front-end to FFmpeg called WinFF. FFmpeg is very good at video conversion, but I find its command line use too overwhelming. WinFF gives a huge range of tweakable presets, which after some experimentation, did exactly what was needed. It is only available on Windows and Linux. A huge number of video conversion tools are also available, including many that run on Apple Macs. One of my biggest challenges was the file size of the finished presentation. I have a relatively powerful laptop but it quickly started to struggle with the accumulation of large images and videos that made up my one hour, particularly image heavy, presentation. I have no idea whether these were the best settings for my needs, but they worked for me, especially during the editing process. They gave the program an enormous performance boost, and improved its stability as well. Then clicked on the Convert button to let it work its magic. Comparing the results with the original (almost always) gave adequate results for a huge reduction in file size of over ninety percent. Till now I have only dealt with the important but boring, bread & butter of my presentation’s construction. Now for one of the exciting contents of my slideshow sandwiches; the before and after transitions. Whilst superficially a simple transition, this proved fairly challenging – till I learnt a way of getting an adequate result. Firstly, my laptop has an aspect ratio of more than 4:3. Therefore I adjusted the width of Google Earth’s left-hand side panel till the central 3d-map view had the same approximate aspect ratio as that of my projector, namely 4:3. Next, as can be seen in the Google Earth image shown here, it has a much wider angle of view than the original photograph. Therefore lining up the two proved to be somewhat challenging. The background hills in Google Earth appear much smaller and further away. I found that if I lined up the skyline and the main features of interest, the position of the camera was often astray. Fortunately I was only striving for adequacy. It may be possible to do more with Google Earth Pro, but sadly it does not run under Linux. Once I had lined up the view in Google Earth, I needed to save it (for the fly-through I created later). This I did by adding a Placemark (a yellow pin), and giving it a suitable name and description. Once saved it will appear in the left-hand panel under Places. For my talk I had several of these placemarks, so created folders to help organise them all. However, this view was (initially) only viewable in Google Earth, and had a great yellow pin right in the middle of it! Fortunately, in the left-hand pane under My Places, a tick box associated with this view (placemark) could be unticked to hide it. Alternatively, right-clicking on the placemark and selecting properties enabled the pin to be dragged to a more suitable location. Then a screenshot was taken, and the image cropped to the screen aspect ratio, as explained in the previous section. The following step was to prepare a destination for the first fly-through. In this case it was to a similar view, captured from Google Earth, of my next old photograph, that of the pre-WW2 Balsdean hamlet taken about 60 metres west of the previous photo. The reason for the fly through was to help the audience orientate themselves in the landscape captured by these two old photos. To do this I created a new placemark in Google Earth to save this new viewpoint following the method given above. Selecting (double clicking) the first placemark I had previously created (making sure I had unticked its box to remove its named yellow flag) I then double clicked on my second placemark to enable my first fly-through. Once satisfied with my helicopter ride from viewpoint to viewpoint I opened up recordMyDesktop to capture the fly-through on video (following these instructions). The resized and reformatted video (via WinFF, as explained above) was then inserted into a new slide. Since the first frame of this video was the same as the last image of the previous slide animation, the transition to the video in the new slide was hardly noticeable. Creating a following slide containing a slow fade from this Google Earth view to that of its equivalent photo, I had successfully completed my first fly-through transition in both time and space. I was happy! And apparently my audience were too. They also liked my next fly-through which was to pull back and upwards to a Google Earth view looking directly down on this area of downland as a whole, encompassing Lewes (where my talk was held) to Balsdean’s north-east, to Brighton & Hove at its south-west. Overlaid flat maps and aerial photographs onto the 3-dimensional contours of Google Earth was another important part of my presentation. However, how I managed to do this I will save for separate blog entry. Partly because I feel this blog post is long enough, but mainly because I have only just started learning Qgis and the last time I tried this I failed to get it to work! You may have gathered by now that I am not a computer multimedia expert. There are definitely other ways of achieving what I did, and some of them may be better and/or easier. If anyone has some helpful suggestions on alternate ways of achieving similar results, or would like more help on this subject, I would very much welcome your feedback. 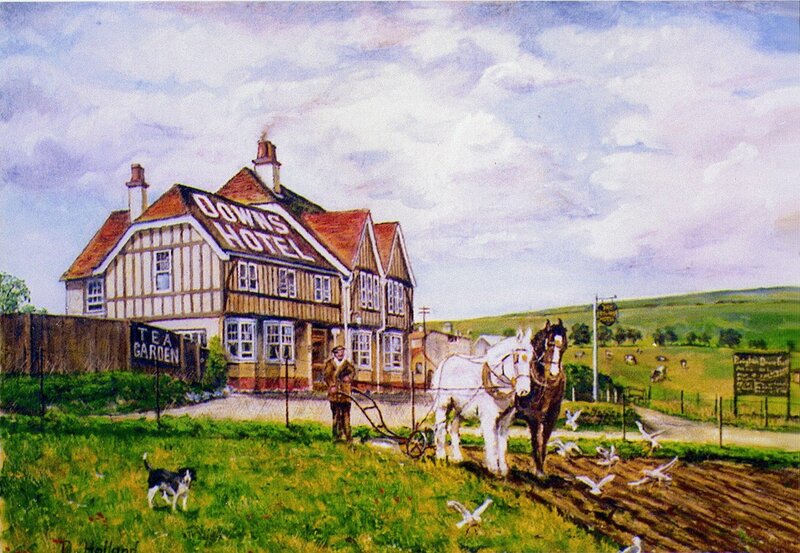 Horse Ploughing, Downs Hotel, Woodingdean from a painting by Douglas Holland. I have been meaning to write about Peter Mercer and John Homewood’s Woodingdean Social History Project for some time now. With the recent passing of my father, I realise more than ever just how precious our memories are. 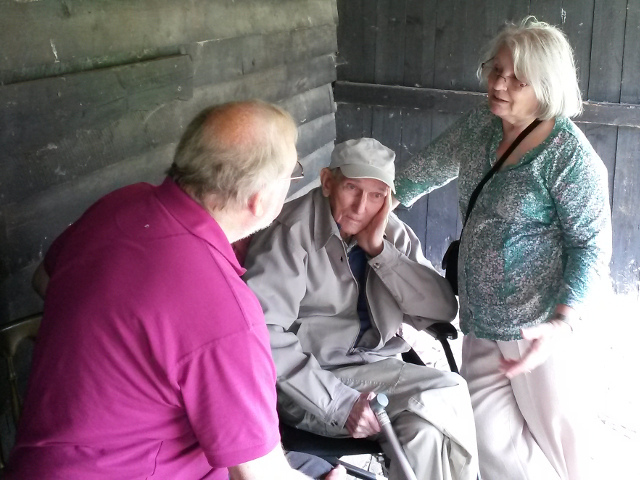 If only he had written – perhaps with my help – more of his ninety years of experiences of his life in the village. Animated gif of The Beehive (birthplace of my dad, centre left, now Treetops Close), Crescent Drive North, Woodingdean, opposite top of Downs Valley Road.. Images, from Cuthbertson, Holland, Mercer collection, and Google Maps. Who knows what changes will occur over the next ninety years in Woodingdean. Peter Mercer, who has written 3 books on Woodingdean’s history, documented many people’s memories from it’s early days. Now it’s your turn! If you have been fortunate (or unfortunate!) enough to have grown up, lived, or worked in Woodingdean, this is a wonderful opportunity for you to write and share your memories and experiences for posterity. Entries can be as long or short as you want. They will become part of the Holland-Mercer Collection – several large albums of more than 500 photographs of Woodingdean and Balsdean. This will eventually be donated to the East Sussex Record Office at The Keep, in Moulescoomb, Brighton, for future generations to research and enjoy. David Cuthbertson at scienceinthegreen@gmail.com, or hand your entry in at the Woodingdean Library. The Downs Hotel, Warren Road, Woodingdean, City of Brighton and Hove, England. 22 October 2011. By Hassocks5489 (Own work) [CC0], via Wikimedia Commons. 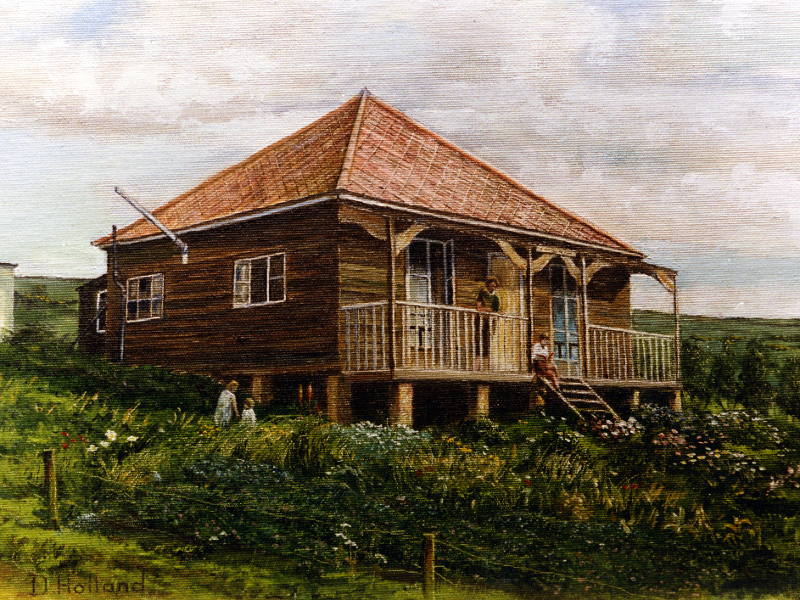 Painting of The Beehive, Crescent Drive North, Woodingdean by my mum’s uncle Douglas Holland from a c. 1930 photograph by dad’s father Duncan Cuthbertson. My dad was born in Woodingdean, 1926, shortly after his family moved into the village. The emerging village of shacks and tracks was almost nearly civilised by the time of his arrival. There was a shop or two, a cafe, and the Downs Hotel had just been opened the year before. Nevertheless, on the Downs Estate, east of the Falmer Road, it was a few years before such luxuries as tarmacked roads, electricity, or mains water arrived. At the time of his death, as far as we are aware, whilst he was not the oldest person in Woodingdean, he was the oldest surviving indigenous Woodingdeaner. 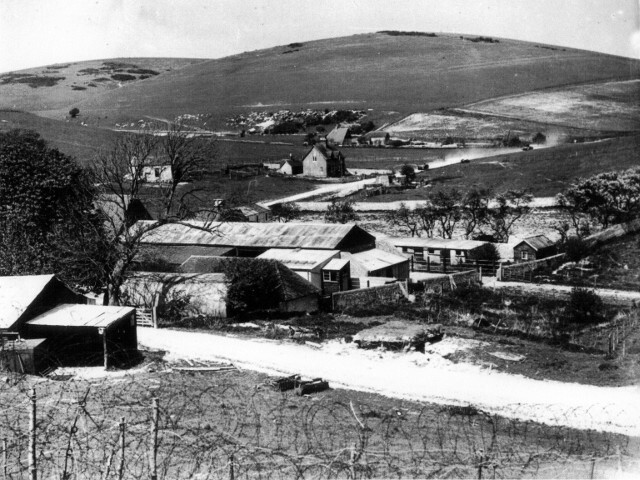 I have touched on the early days of Woodingdean in two previous blog entries, Woodingdean and the Great War; Common Origins, and WW2 & the Woodingdean Downs Talk, as well as in the last two draft chapters of my Newmarket Farm book, Chapter 8. New Developments — 1911–1925, and Chapter 9. Brighton Corporation — 1925– Present. More can be read in the three books on Woodingdean’s early history by Peter Mercer. One day soon I hope to write of some of my dad’s experiences of early Woodingdean in more detail. But not today. Meanwhile, here are a very few pictures of some of his contributions to our dig. Looking SW from front to back of house; 3rd May 2013. Looking N at excavation of the possible front door; 3rd May 2013. Newmarket Cottage, looking SE; 3rd May 2013. My parents with Mr Edwards. Michelham Priory WW2 Event, 19th August 2015. He was a quiet, intelligent man, practical man, with a sense of humour, adventure, appreciation of nature, and a belief in our responsibilities to others and the planet. He will be missed by many. Exciting New WW2 Balsdean Talk! Weds 18th January 2017 I will be giving my next illustrated talk for the Sussex Military History Society at 7.30 for 8.00pm, in the Royal Oak Public House, Station Street, Lewes, East Sussex. I have been researching Balsdean’s military history in detail for over a year now, and have made some exciting new discoveries regarding the many military activities in the area. The most shocking for me was the use of Balsdean for a mustard gas training exercise in July 1941 – the gas bombs landing only a kilometre away from where my mother’s family were living at Newmarket Farm. I have identified a possible firing position and, based on the distance to the known locations of the bombs found after the exercise, I believe they may have been using an experimental livens projector capable of a much longer firing range than usual. I have also located the former site of a figure of eight narrow gauge railway used for anti-tank target practice. I was told by friends of my dad that they (illegally) snuck into the Balsdean Training Area during the war and had a ride on it. Letting off the brake they said they had a big scare when it set off at speed downhill with them onboard! My talk is of the highlights sifted out from thousands of pages of documents ranging from military war diaries, Home Guard records, civil authorities such as the Sussex Police and East Sussex War Agricultural Executive Committee (for whom my father worked), as well as newspaper reports of the day. Though it was originally to be largely based on the personal memories of those who lived and worked in the area, my talk’s main emphasis is now on my new military research findings which I hope will be of interest to the military enthusiasts who make up the SMHS membership. Though I know the area well I am not a historian (military or otherwise) and until recently had no interest in the military activities that took place in Balsdean during WW2. I have therefore been amazed at just how much history I have uncovered – far more than can be shared in just one short hour. I therefore plan to adapt the talk for a series of blog page articles, covering much of the material cut from the talk. 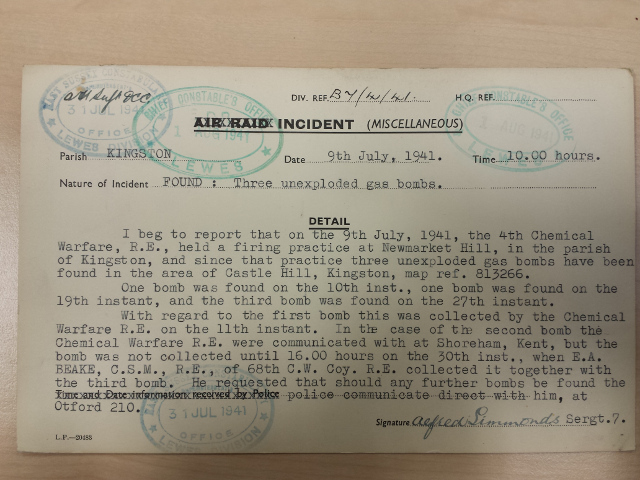 Three unexploded gas bombs found near Balsdean, July 1941. Source, The Keep, East Sussex Record Office. SouthDownHill Wordpress.com blog by David Cuthbertson is licensed under a Creative Commons Attribution-NonCommercial-ShareAlike 4.0 International License.